What is the almighty, most sought after word on the Internet? Right, it is FREE. Free online translation including, of course. Talking about FREE translation, how come that a professional business service can be FREE? What's the catch? We have to acknowledge that Google and other providers of free translation services spend lots of money on developing and improving those complicated artificial intelligence tools, so the first reason does not apply. So, we can guess that the second and third reasons describe the situation better - while developing the free translation tools are available to anybody to use and even improve them (remember their button "suggest a better translation"? ), but when developed they will stop to be free. In the meanwhile, they are FREE and let's see how you can use them. Let's say you are a real estate broker who used some FREE advice to bring foreign buyers to your listings in a FREE way. The advice was to translate your listings with a free translation tool online into a foreign language(s) and put these translated listings on your website. Done. Bingo! Foreign buyers will come. But will they? For now, we leave alone pure Internet things. I mean that people usually use search engines in their own languages; and your translated website has to be submitted and promoted to foreign search engines to be found, etc., etc., etc. It's another chapter of the story, called "Foreign Internet". We concentrate on the Translation part of the business here. Okay, you translated your listings into a foreign language for free. As you don't know the foreign language, you have no idea what your foreign readers will actually get, right? To have the idea, you can try the other way around - get that foreign language real estate listings from any website you manage to find in that language and translate them with the same free online translation tool into English. Now you can see how good their foreign listings look in your own language and thus have the approximate idea how good or bad your listings will look in their language. Most of the time you will be disappointed. But what do you do to attract foreign buyers to your properties online? Can you use free online translation tools anyway? How to Properly Use Free Online Translation in Real Estate Business? 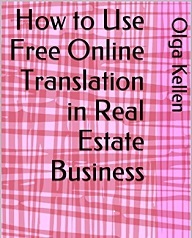 The e-book *How to Use Free Online Translation in Real Estate Business* is a complete practical guide to the translation of your foreign marketing websites, listings, brochures and correspondence; also to interpreting for your foreign real estate buyers and ways to save on translation services (including the proper use of the free online tools) without losing the quality. The book is selling on Amazon for only $2.99. There are many things to consider before starting to sell real estate to the foreign buyers, and one of them is the language problem: How to properly deliver the information on your properties to international investors and make them buy from you? Will free translation tools accomplish the task? This e-book is about the effective and appropriate procedures of translating and interpreting for the foreigners who are the prospective buyers of your properties, including the correct usage of the free online translation. * How to save on translations. Let’s talk about the best practices in international real estate marketing.